I want to publish in the Store an HoloLens app. How to solve this? Any help? 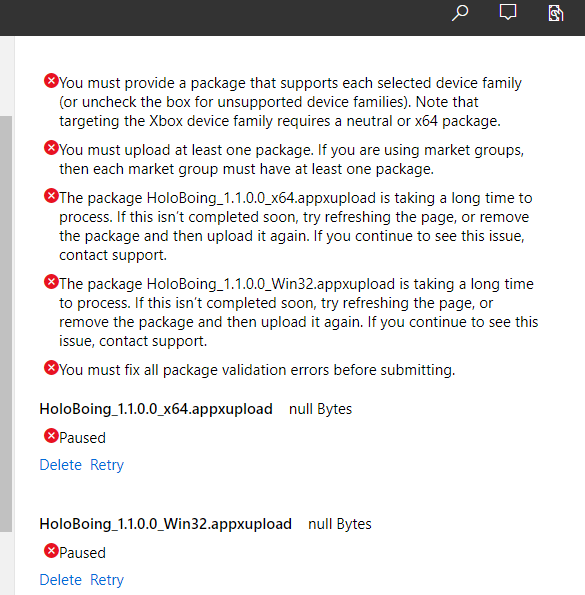 I tried to edit the manifest adding as device family Windows.Holographic (when I build in Unity it automatically generates a manifest with device family Windows.Universal) and still get errors. It's frustrating. Any help? I used Unity 2018.2.12f1 and Visual Studio 2017. Build Master, x86, device. All icons/photos included. The project is associated to the windows store. Used UNET core. Used IL2CPP backend for building in Unity3D. Building Options in Unity: HoloLens, D3D, latest version SDK, Local machine. In addition to the previous options, I should have added a Visual Asset in Microsoft Studio, and clicked on generate. I should have double checked that in the Partner Center that I had only Windows Holographic selected (in consistency with the manifest). And also, I should have updated everything (windows certification kit, visual studio). Plus, I should have deleted HolographicStreamerDesktop.dll in Visual Studio.